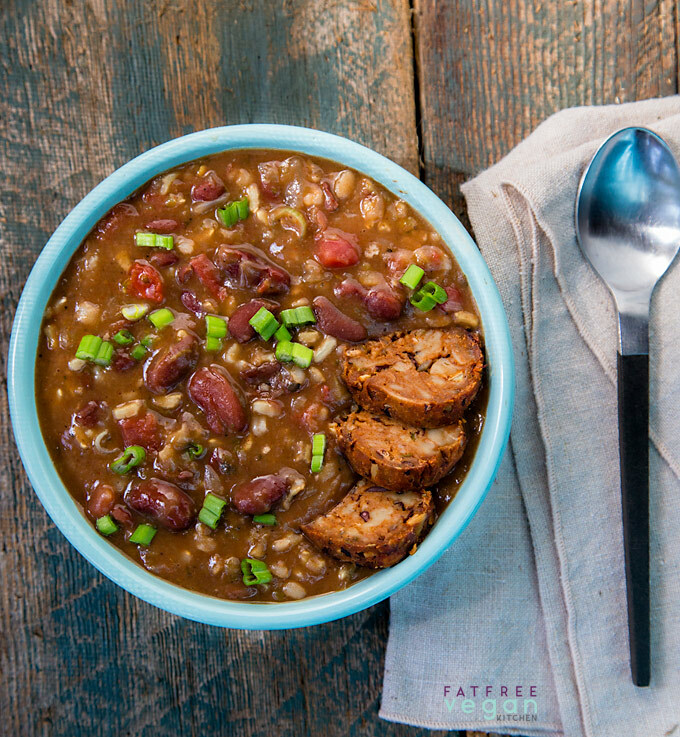 Sometimes you just need comfort food, like this creamy Instant Pot red beans and rice soup. Sometimes those times can stretch into weeks… and months. Our 2018 started with a bang, literally. On January 3, our daughter E was driving D’s car when a man in a truck pulled out and hit her, knocking her and D’s small Honda Civic off the road. Fortunately, E was fine–shaken but physically unhurt. The same couldn’t be said for D’s car, which was totaled. Way to start the new year! And if anything, the year has gotten worse, not better. My father has been hospitalized for serious problems twice, so I’ve been out of town to visit him and my mother more than usual. And can I just say that the weather has been especially sucky this year–extreme cold, even snow, alternating with rains. I’ve been taking Foxley to dog training classes, which constantly have to be rescheduled due to bad weather or my being out of town. 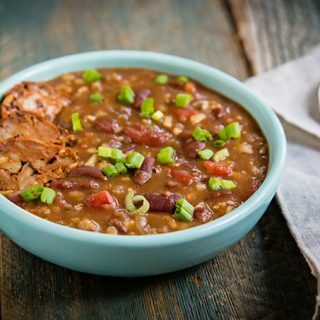 So comfort food has been high on the menu this year, and nothing says comfort to Louisianians (even those living in Mississippi) more than red beans and rice. D and I have eaten a lot of vegan red beans and rice lately, though when we’re pressed for time, they’re sometimes made from canned beans or–gasp–directly from a can. In Louisiana, we don’t mix the red beans and rice together. The beans are served with a scoop of rice on top or underneath, but we don’t combine the two before serving. I always gasp when I see a recipe purporting to be authentic that looks more like a rice pilaf than red beans and rice. That’s just not how it’s done. Except that’s what I just did in this soup. I thought it would be fun to just shake things up a bit and make our favorite comfort meal into a soup, similar to my Refried Bean Soup (though, sorry, not as Ridiculously Easy.) Like that soup, this one is thickened by the beans so that it’s creamy and filling. All you need is a salad or side vegetable to make it a meal. I used the Instant Pot to speed things up a bit and to make it easier to just start the pot and go on to other things. I used Camellia red beans, which are traditional in New Orleans. Why don’t you put all the vegetables and seasonings in the Instant Pot at one time? Why did you pre-soak the beans? Doesn’t the Instant Pot make pre-soaking unnecessary? Pre-soaking the beans (I did the quick-soak mentioned in the recipe) allows the beans and rice to cook in the same amount of time. Otherwise, the rice will be cooked long before the beans are tender. 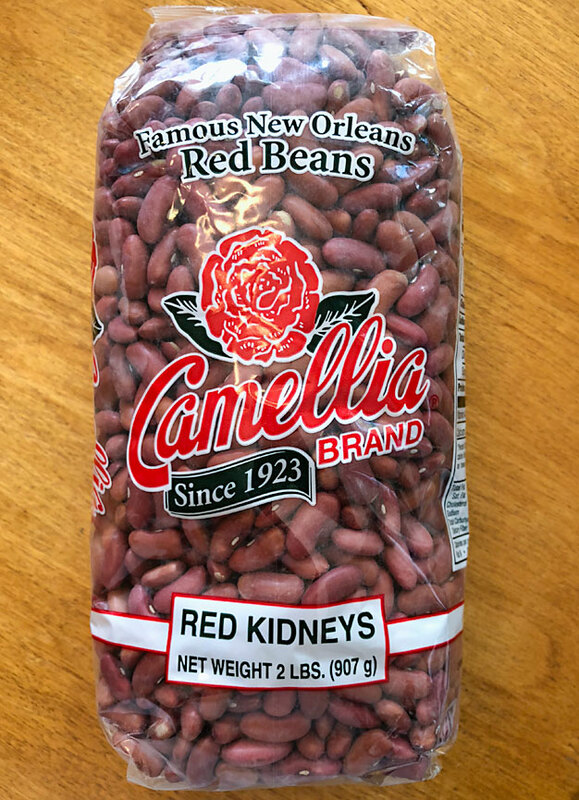 Do the Camellia beans take less time to cook than other kidney beans? Possibly. They do seem a bit smaller than some other kidney beans, which is why I mention what to do if the beans aren’t done after pressure cooking. If you’re using large kidney beans, I suggest adding 5 minutes to the pressure cooking time, just to be safe. So many factors can affect bean cooking (age of beans, altitude, exact type of beans) that it’s hard to give a cooking time that works for everyone. But I can say that using Camellia red beans, I was able to get them soft in 25 minutes of pressure cooking with 30 minutes of natural pressure release. Won’t salt and tomatoes keep the beans from softening? Tomatoes, yes. Salt, no. Studies have shown that salting the beans does not adversely affect cooking time and may actually result in more flavorful beans. The acidity of tomatoes, on the other hand, can delay softening of the beans, which is why I add them only after the beans are done. What if I don’t have an Instant Pot? Can I cook this recipe in a regular pressure cooker or on the stove? You should be able to cook this soup in any pressure cooker with no change to the method or ingredients. Cooking it on the stove is a little trickier: You’ll need to increase the time and the amount of water. I suggest bringing the beans and rice to a boil and then simmering it, covered, for about an hour, checking often to add water if it starts to boil dry. Don’t add the tomatoes until the beans are completely soft. What’s that sliced sausage in the photos? I made an Andouille-style seitan sausage to go along with this, and though my husband loved it, I felt the recipe is not quite good enough to post. Instead, I suggest using either my Italian Fauxsages with a little smoked paprika added or my Homemade Veggie Dogs. Where can I get more vegan Instant Pot recipes? 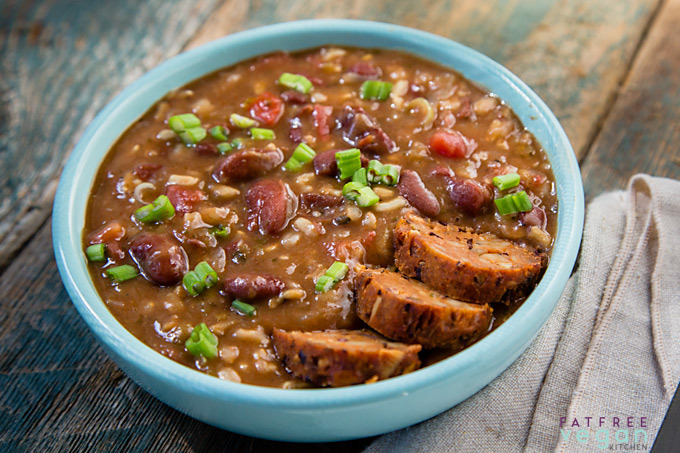 Cooking the beans and rice at the same time results in a rich, creamy main course soup with all the flavors of traditional New Orleans red beans and rice, vegan style! Check the beans carefully for rocks and other debris and wash them well. Either soak them overnight with enough water to cover them by two inches; or do a quick-soak: put them in the Instant Pot or pressure cooker with at least 2 inches of water covering them, seal the cooker, and set it on high pressure for 1 minute. Allow the pressure to come down naturally; don’t open the pot for at least 30 minutes. Drain the beans well. Rinse out the Instant Pot if you used it for the quick-soak. Place the onions and garlic in a food processor and pulse to chop very fine. Transfer to the Instant Pot and begin sautéing on medium heat. Use the processor to chop the bell pepper and celery and add them to the pot. Cook until the vegetables soften, about 5 minutes. Remove about half of the vegetables and set aside. Add the red beans, water, rice, and salt to the pot. Add about half of the seasoning mix. Seal the cooker, and set on high pressure for 25 minutes. When the cooking time is complete, allow the pressure to come down naturally for about 30 minutes. If pressure remains after 30 minutes, quick-release the pressure. Check the beans. They should be done or just a little undercooked. If they are still hard, close the pot and bring back to high pressure for 5-10 minutes and quick-release. Add the reserved vegetables and seasoning mix to the pot along with the tomatoes. If the soup seems too thick, add extra water. Use the sauté setting on low to cook the soup for about 20 minutes, stirring and scraping the bottom often. Just before serving, add the smoked salt and additional salt to taste. Serve sprinkled with sliced green onions and hot sauce as needed. If you like, slice up a little vegan sausage such as Italian Fauxsages to serve on the on the side. Well, that’s a lot of chatter about such a basic, home-style soup. I hope you’ll enjoy it! Be sure to let me know your results and adaptations in the comments. As I don’t have a pressure cooker could I cook this in a slow cooker? Honestly, I wouldn’t risk it. 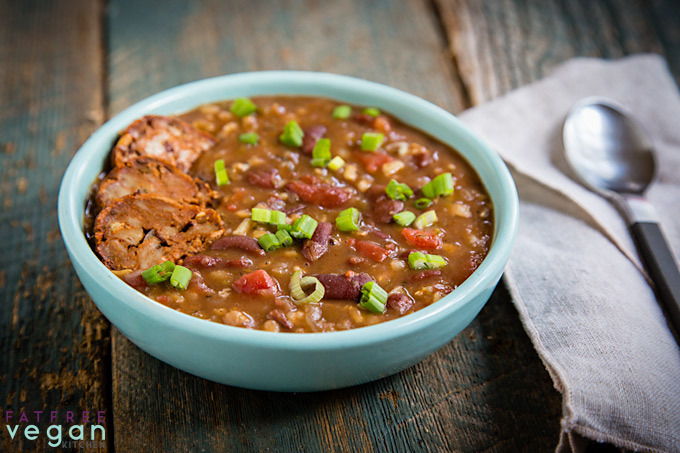 Undercooked red beans contain a toxin that can make you sick, and a slow cooker doesn’t get hot enough to destroy the toxin. If you want to cook them. You’ll need to soak them for at least 5 hours and then bring to a boil for at least 10 minutes before putting them into the slow cooker. Instant Pots are a new phenomenon and people have cooked dried red beans in crock pots for a long time. Is it really unsafe? I want to make this and I was thinking of soaking the beans overnight and putting them in a slow cooker. Just trying to clarify. I don’t have an instant pot yet, not in my budget. I’ve always boiled white kidney beans (cannellini) as well as red kidneys, but I think there might be some question as to whether it’s necessary with the white ones, I’ve read both yes and no on it, but I figure why take a chance. My 3-quart IP arrives tomorrow, and this will be my first recipe in it! Thank you, thank you! Hubby just bought me an Instant pot for Valentines Day, so I am looking for all the recipes I can get! OK… you must have read my mind! I had some smaller red beans (dry, not canned) that I wanted to use for tonight’s dinner, but just didn’t quite know what to do with them. In fact, when I saw this post, they were happily soaking in some water waiting for me to dream up something. (I know you technically don’t NEED to presoak beans for the InstantPot, but I have found that even soaking them for a couple of hours makes them all cook so much more uniformly.) The smaller bean works beautifully in this recipe. I don’t know what was more genius, 1) using the food processor to finely chop ingredients (maybe that extra surface area infuses the soup with more flavor? I don’t know. ), or 2) reserving half of the veggie mixture to add back into the pot after pressure has been released! Finally, my husband remarked that he really enjoyed the flavor profile so much and he asked what spices were in the soup. So, that’s a HUGE win as he normally happily eats whatever I give him even if it is kind of “meh”. This was definitely not “meh”. It was fantastic! OK… so this is going into my make-again-SOON pile for sure! One final note (I promise! ): I eat salt free. This soup is so packed with flavor that eliminating the smoked salt was not an issue at all. Thank you for writing such a thorough review the very day the recipe was posted. I’m so happy you and your husband liked it! And that it works salt-free! I thought red beans and red kidney beans are two different types of beans. I always see separate packages (dried) and cans of red beans and red kidney beans in the grocery store. Are they basically the same type of bean or different? When I saw the title of your post, I was surprised to see that the package of beans you used said red kidney beans. I was also surprised to see “kidney” on the package; I think in the past it just said red beans. I think that Camellia is a little smaller than other kidney beans, but I didn’t have any dried kidney beans to compare them to. They’re definitely not as big and tough and brightly colored as the dark red kidney beans you can buy in cans, but they look a lot like the light red ones. Susan, such a relief to see you posting again and to hear your health is fine! A huge welcome back. I will certainly try this recipe, although being Instant Pot-less I’ll do it on the stove or in the crockpot ( paying attention to your warnings about undercooking). Thank you for feeding my addiction to your blog. This looks great! I’m going to make it this weekend with black beans. I hope things get better for you and your family! Recipe looks great. Most importantly, I am one of those peole who prays over your cancer. Glad you are ok and I hope March is much better. This looks really good. I like using dried beans instead of canned beans. Sweet potatoes may be a good addition too to change it up. Thank you for all of your delicious recipes. I am the only vegan I know; I have no arthritis in my hands. I love eating this way and you were the first website I discovered–I think it has been 6 years. When I enter the nutritional information in the Weight Watchers Recipe builder app I come up with 7 points per 1 34 cup serving. How do you come up with 2? That’s odd. Are you using the latest Freestyle app? I used the recipe builder, and the only ingredient with any points was the rice. Beans and vegetables are all zero points. I enter it as 8 servings, so the entire recipe has 16 points. All I wanted to say is thank you. I have CAD and cannot have any oils, nuts, seeds, tahini and avocado in my diet. Although I have not tried any recipes as yet I am grateful that there are people like you that have. I look forward to trying them very soon. Delicious and filling! Perfectly rounded out with some Chipotle Vegan Sausage and a bed of greens! I am glad your daughter is well, but am sorry to hear you’re going through such a rough spot. Thank you for taking the time to share this with us in the midst of all the challenges you have been facing. On top of all the many things I am either sensitive or allergic to, tomatoes are among the big no’s for me. Is there any way to make this taste just as yummy without them? Gluten, nuts, and anything with healthy fats are also a big no for me. This is an outstanding recipe! The Instant Pot makes it easy to prepare. I think the secret, however, is the spice mix which is just delightful – flavorful but not too hot. Love it! Having a toddler means I don’t often do recipes with a lot of steps anymore! So although I appreciate the attention to detail with this recipe, I modified it to meet my needs. I added all the veggies and sauteed for a minute and then added the season mix and sauteed it for about 2 minutes and de-glazed with a bit of stock before adding the rest of the ingredients (except tomatoes) and pressure cooked for 30 minutes and then a quick release after maybe 10 minutes. I then added the tomatoes. The beans were perfectly cooked. We thought it was delicious and great with a bit of hot sauce too! This is an outstanding recipe! such a relief to see you posting again and to hear your health is fine! A huge welcome back. Loved this recipe! Great alternative to chili which I am not a huge fan of. Served with cornbread and it was so satisfying. Not gonna lie though, I madde it with barley instead of rice because I am a huge barley fan. Easy to make! I found it a little bland, so added 2 bay leaves, 1-1/2 tsp dried basil, 1/2 tsp dried sage, 2 tsp dried parsley, and 1 Tbl cider vinegar. Serve with hot sauce for those who like it spicy. (I cut down the cayenne in the seasoning mix, since some in my potluck group need it mild.) This recipe finally got me to buy smoked paprika – what a difference! I set that out as an option to add, too. Thanks for this recipe! This is just excellent. I’ve eaten it three day straight and am fretting that tomorrow will be the last meal from this batch. Apparently my husband added a big wad of hatch green chiles because I feel like I’m glowing but the richness of your seasoning makes the dish immensely satisfying. And 2 pts!! Thank you so much. Thanks so much for the delicious recipe. My son is vegan, so I enjoy cooking things he will eat. This is the second time I have made this for him and I. My 3 year old grandson decided he wanted a bite of mine. He loves this as well. He just finished his second helping and is eyeing up the rest of mine😁 He loves beans and rice, especially black beans.